Although designs for cardboard cookers have gotten simpler, fitting a lid can still be difficult and time consuming. In this version, a lid is formed automatically from the outer box. 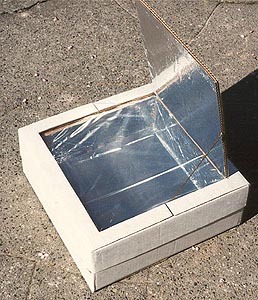 Glue aluminum foil to the inside of the liner and to the bottom of the outer box inside. As the glue is drying, line the inside of the inner box with aluminum foil. Turn the oven over and open the bottom flaps. Place one foiled cardboard panel into each airspace to divide each into two spaces. The foiled side should face the center of the oven.